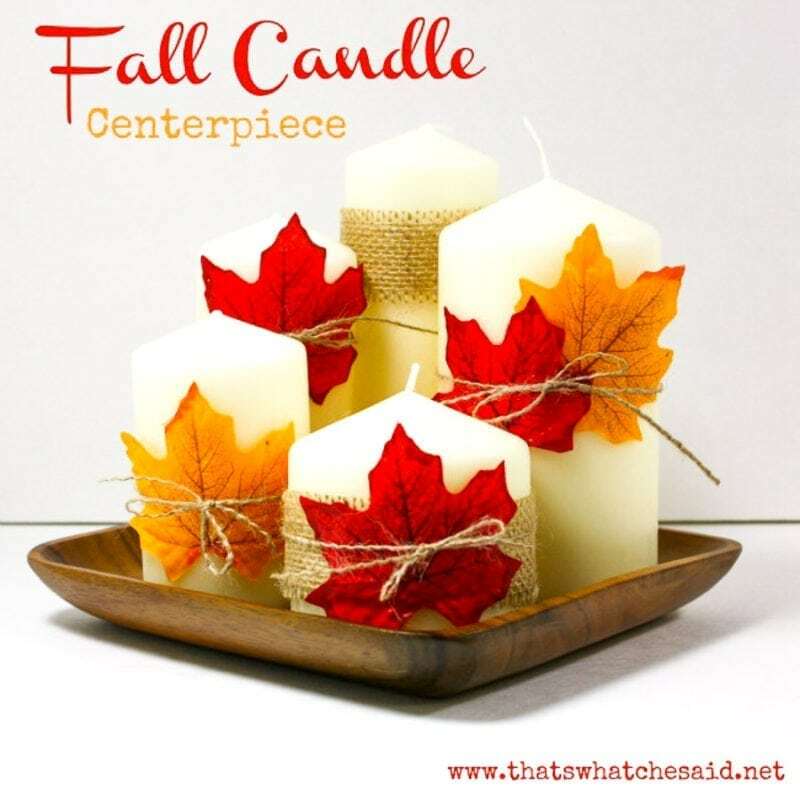 The perfect centerpiece for your fall table! I love fall colors! I also love the leaves…when they are not in my yard for me to rake! 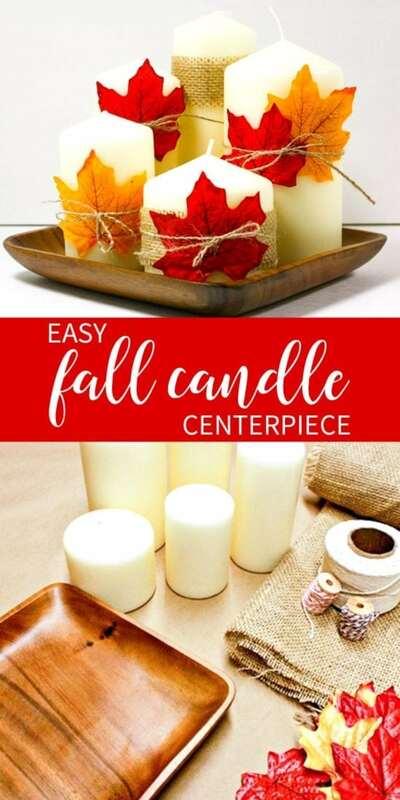 I’d love for you to see how I made this super cute fall candle centerpiece with inexpensive supplies! 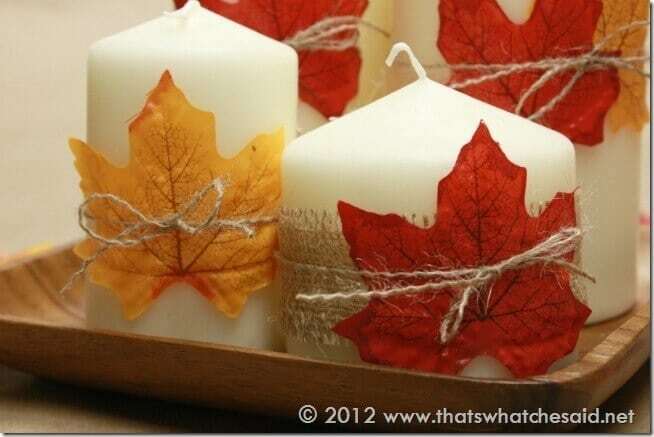 Perfect for your table centerpiece or to adorn your fall mantel! I have some orange, brown and natural twine in the photo above but as I got assembling, I realized I didn’t like any of those and just used a strip of the burlap to tie the leaves on! You can certainly use the twine if you prefer that! There really is no rhyme or reason to this. I just played with the leaves and the burlap and came up with some combinations that I liked together. 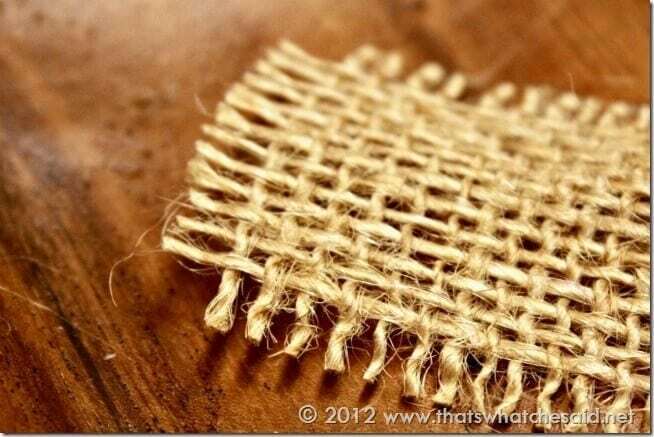 I cut a piece of burlap and then removed a few of the strings along the edges to give a frayed look. 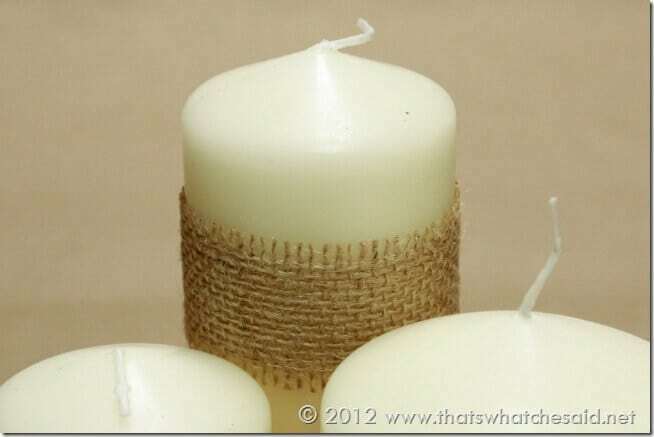 I wrapped this around the candle and applied a leaf and tied with a string of the burlap! Here you can see one candle with just a leaf and one with both burlap and a leaf. Then I threw in one with only a burlap ribbon! I put it towards the top since the candle was in the back of my centerpiece! 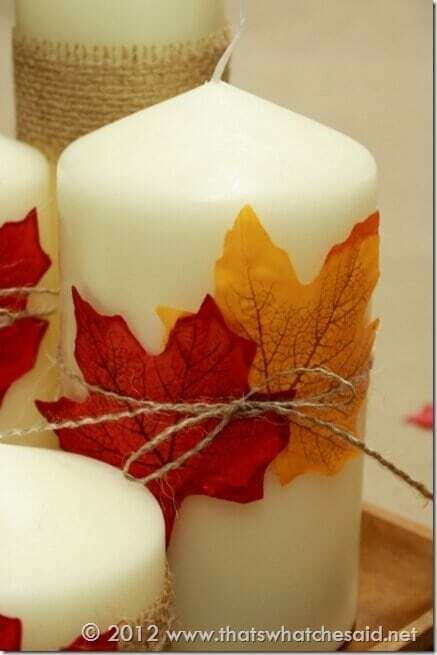 And lastly, don’t be afraid to use more than one leaf on a single candle! There you have it. So easy but so festive! 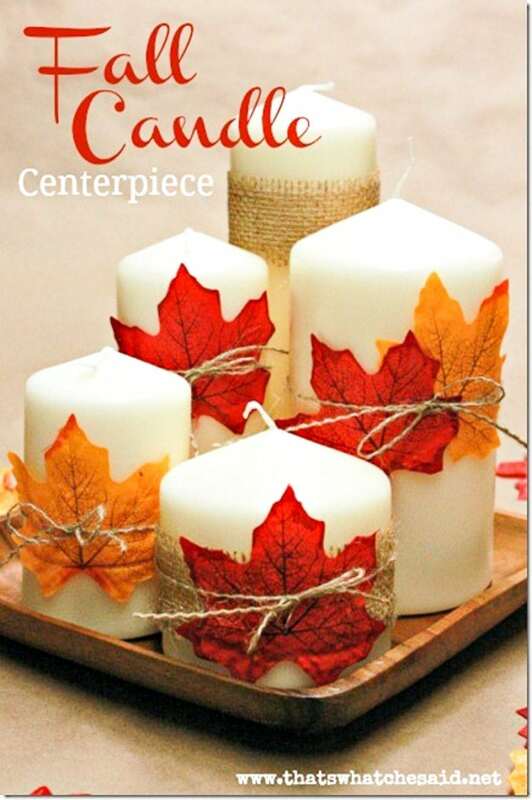 This would look great on your mantle or on your Thanksgiving day table! Mix and match and do what you like! 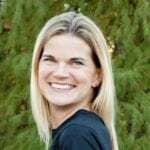 I love projects with flexibility! 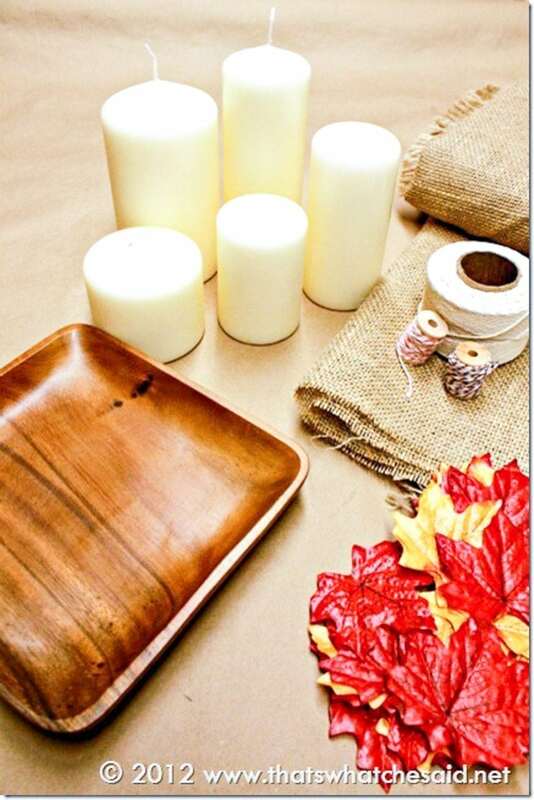 If you liked this thrifty project you will LOVE my Turkey Place Card Holders and Turkey Napkin Rings made from fake fall flowers from the dollar store as well! Who said cute decor had to be expensive? Have leftover fake leaves from this project? How about making yourself some adorable Turkey Magnets with them! 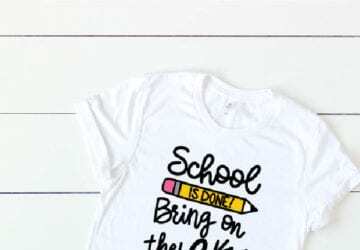 You can check out more of my Fall Projects Here! 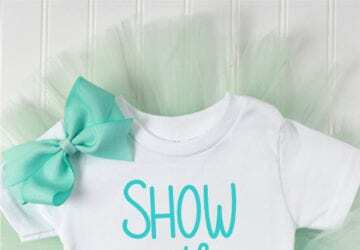 As well as all of my Craft Projects all in one place!